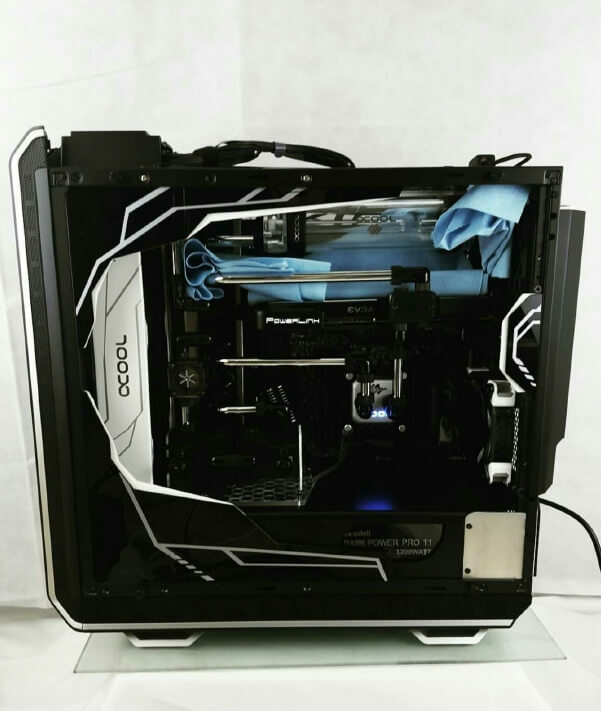 So you're interested in watercooling your computer but, you're teetering between an AIO (all in one) solution and a full blown custom loop. Knowing what's involved can help you be fully informed on which will best suit your needs. Custom watercooling has many advantages over the traditional way of using heatsinks and fans. It's more efficient, quieter and it looks undeniably awesome. 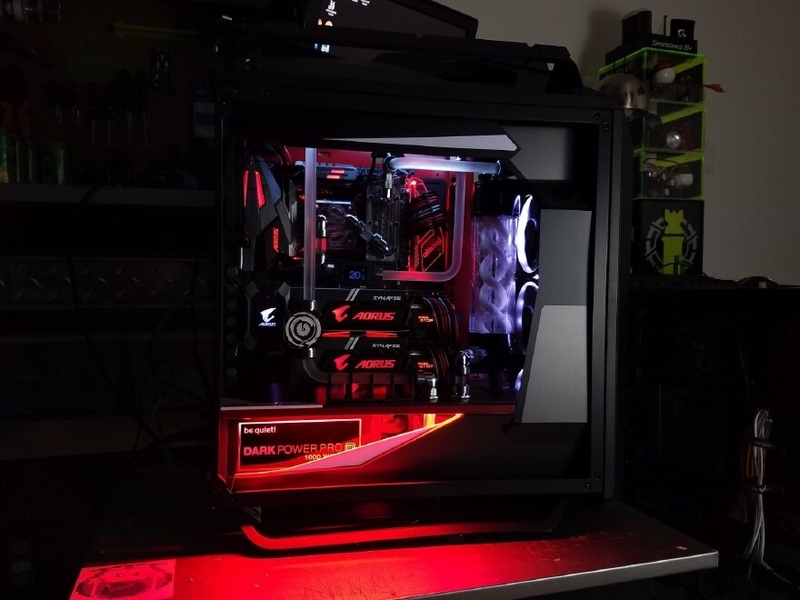 There's information available on what's included in a custom watercooling loop but, not much in the way of details from the perspective of a Professional Case Modder. Everybody has their own way of doing custom watercooling loops and after doing it for years I've come across a lot of useful information. We'll take you on a journey into the ways we choose which paths to take and how to implement those decisions. There's nothing like having useful tips, tricks and give you inside look into making a custom hardline watercooling loop. port at the lowest part of the loop and plan to fill through the top of your reservoir. This leaves us with a lot of space for creativity. Hardline is quickly becoming the standard in custom watercooling loops. 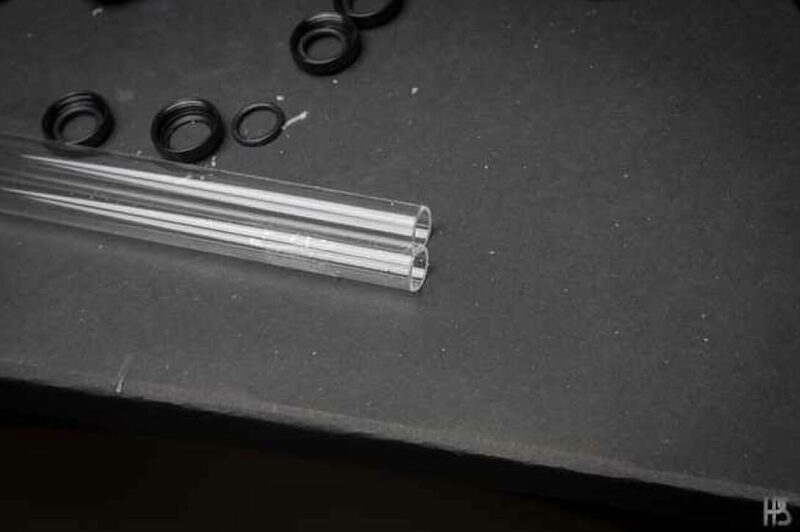 Hardline is tubing typically made from PETG or acrylic. While it can be more difficult to implement; the final product is beyond worth it. I've always been a believer that each computer system has its own style. You can change that style drastically depending how you place your watercooling tubing. Take this into consideration while planning your layout. metal wire that was easy to bend but, retained its shape. A pipe cleaner can also be substituted for thin wire. This gets you close to knowing the tubing needed and can also be used to determine the bends. You'll need to consider the tubing will go into each fitting about 10mm, which needs to be taken into account when determining the length. Always making sure to add a little extra both before and after the bend which allows you to fine tune it. straight, even cut that can be quicker than a rotatable pipe cutter. Bending hardline can be tricky at first. You'll also need a latex insert which goes inside the hardline and keeps the tubing from collapsing when making bends. 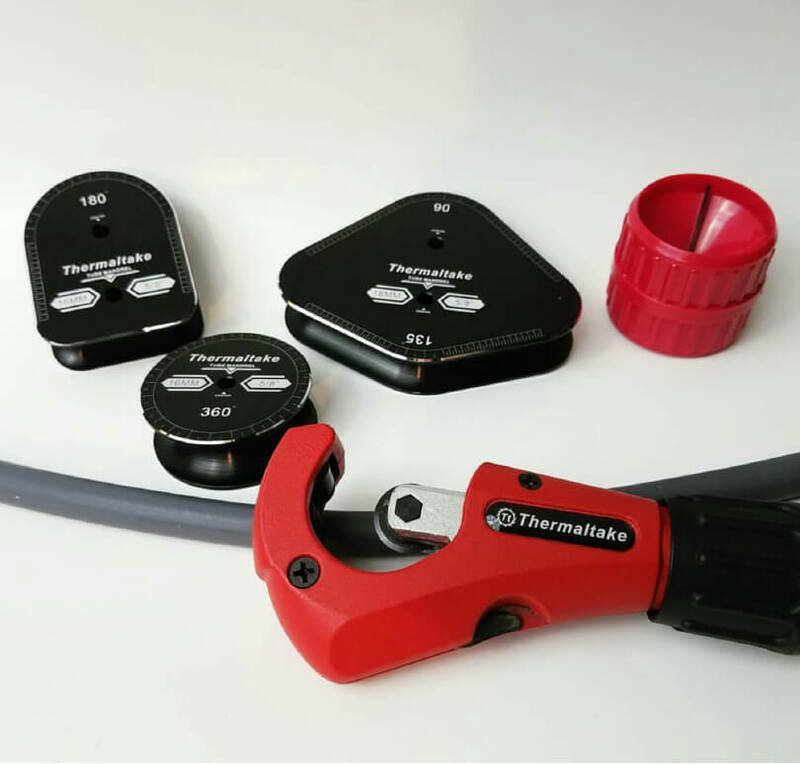 A heat gun is used to warm up the tubing enough to make it bendable. The tubing is then rotated back and forth; making sure to evenly heat the tubing until it becomes soft. Using a slow, even pressure make your bend to the required angle. You can also buy mandrels which will make it easier to bend to specific angles however, mandrels are not required. throughout the loop. This will help limit the chances of leaks in the next step; leak testing. It's important to limit the chances of getting a leak but, we also want to prepare just in case it does happen. Disconnect all power cables except for the one that's needed to power the pump. That way if a leak does occur, it can be dried out without damaging components. 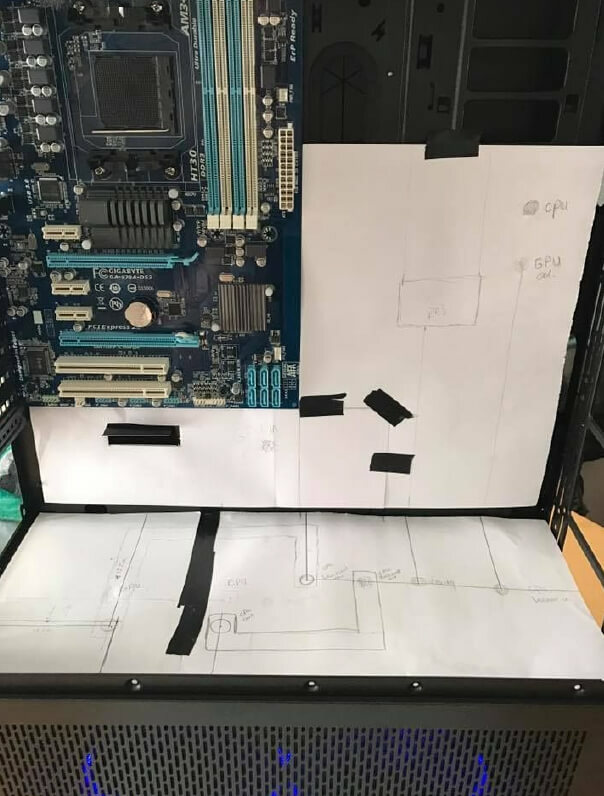 Typically the power supply is activated through the motherboard. In order to get it powered up while disconnected, you'll need to jump the green wire with a ground wire. If you're uncomfortable jumping it this way, you can always buy a PSU jumper for a few bucks online. hardware and it makes it easier to spot small leaks. With the power supply off we need to fill up the reservoir. Usually I'll fill it up about ¾ of the way to the top; making sure to add coolant slowly to limit extra air bubbles. Take notice of the fitting junctions as you fill your loop. If you spot a small leak you can tighten the affected fitting or drain what you put in to make adjustments. Now that the reservoir is most the way full, it's time to turn your pump ON. You want to run it long enough for it to empty most of the reservoir without running the pump dry. Running the pump dry can cause it to heat up which could result in damage. Add more coolant and power the pump again to push it through the system. Repeat this step until coolant is coming into the inlet in the reservoir. By now your system will be full and it's a good time to thoroughly check the system to make sure that there is absolutely no leaks. After a good check, you can power up the pump and just let it run by itself. This allows air to work its way out of the system, as well as gives the loop plenty of time to confirm that there's no small leaks present. Most recommended letting the pump run like this for 24 hours before connecting all the PSU wires and firing up your machine for the first time. thing of the past. Doing your own custom loop can give you an overwhelming sense of accomplishment. At first it can seems scary but, all that fades away quickly. Youtube is your friend and they're a massive resource of “how to” watercooling videos. Make sure to buy extra tubing; especially your first time as mistakes will be made. There's one thing I can guarantee. If you do your own custom watercooling loop; you'll never look back. I've never felt more proud of accomplishing something then when I finished my first custom loop.